You have won a $20 credit from Something To Do Beads. Please send Claire an email with your information. Welcome to the Humblebeads studio this week. Grab a cup of cocoa and put on some holiday music, it's going to look a lot like Christmas here today! A few weeks ago I launched my holiday line of beads inspired by cozy cabins, handmade goodness, sweet woodland animals and other wintery woodland inspirations. 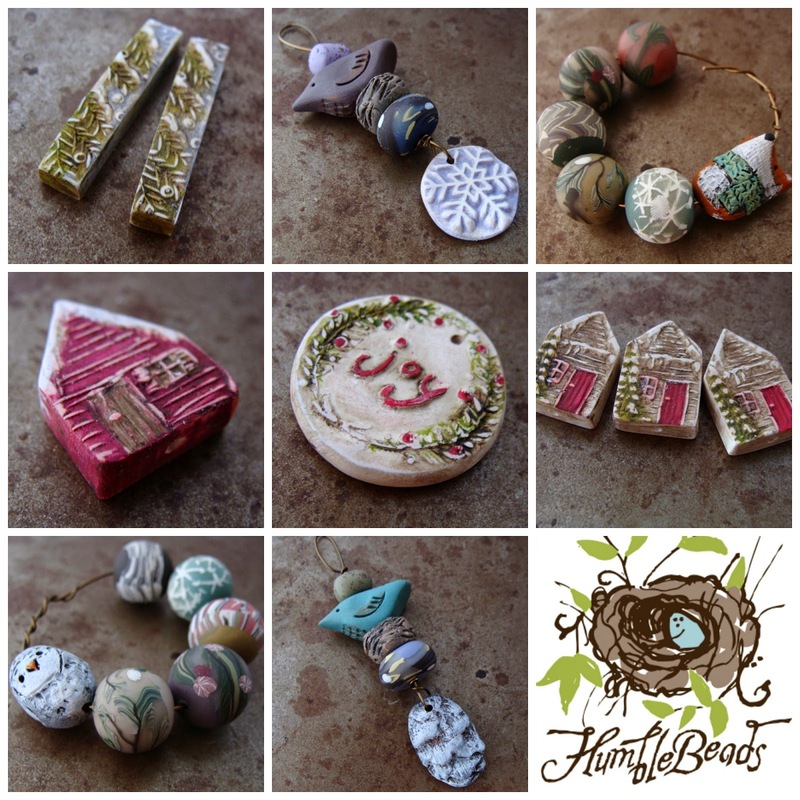 These adorable cabin beads have been on my bead table just waiting to became holiday jewelry. I knew I wanted to keep it simple and let the beads shine bright. But sometimes keeping it understated can be a challenge too, every part has to be just so. So to kick off the holiday season here is the project, sweet and simple - you can became a little elf and whip up whole village. I didn't have snowflake charm on hand, so I created one by hammering a six-sided bead cap flat. When hammering bead caps, go very slow and gently to avoid breaking the cap which can happen on items that are plated. 1. Add 6mm jump ring to the flattened bead cap. 2. Create a loop 1 1/2" from the bottom of the wire, open loop, slide on snowflake, close loop, wrap wire to create a wrapped looped. 3. String on crystal, copper spacer, house bead. Create wrapped loop on top of house bead. 4. Add a crystal to the headpin, create a wrapped loop. 5. Attach 4mm jump rings to the ends of the chain. Add house pendant, crystal dangle and both ends of chain to the 15mm jump ring. 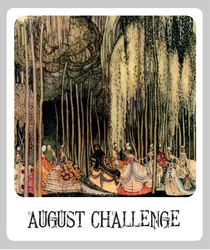 So my question for you today - what is a clever way you have used a finding? (Like my bead caps becoming snowflakes.) One random winner will receive a $25 gift certificate to my Humblebeads Etsy Shop. Can't wait to read your clever responses! I used to play around with findings, fusing them together and to larger sheets of metal to turn into pendants bangles etc. I'm not sure it was particularly clever though. I love those houses. I wish that I could say that I have found some inventive way to use findings but alas no. I am still stuck in the box on that score. I do just love tutorial though! Perfect for ornaments as well as necklaces. I haven't done anything super clever with findings, but I have done my share of hammering bead caps and slightly domed rings flat and riveting them to other pieces for pendants or earrings. Not really innovative, but I like using Vintaj filigree for wrapping around wooden tile pendants or other focals, flattened bead caps for all sorts of different uses and small number of intertwined textured jump rings as spacers. 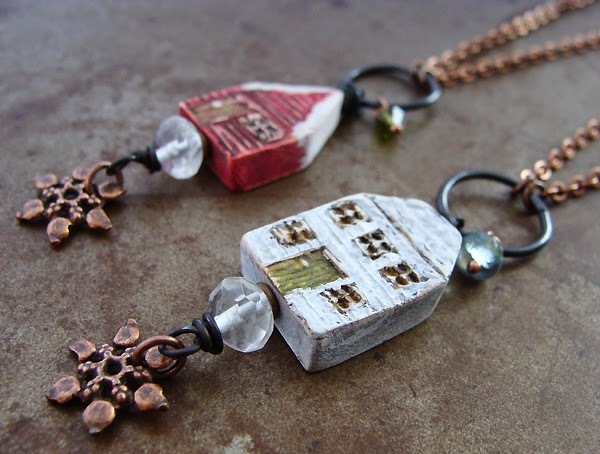 I love those house pendants, thank you!!! 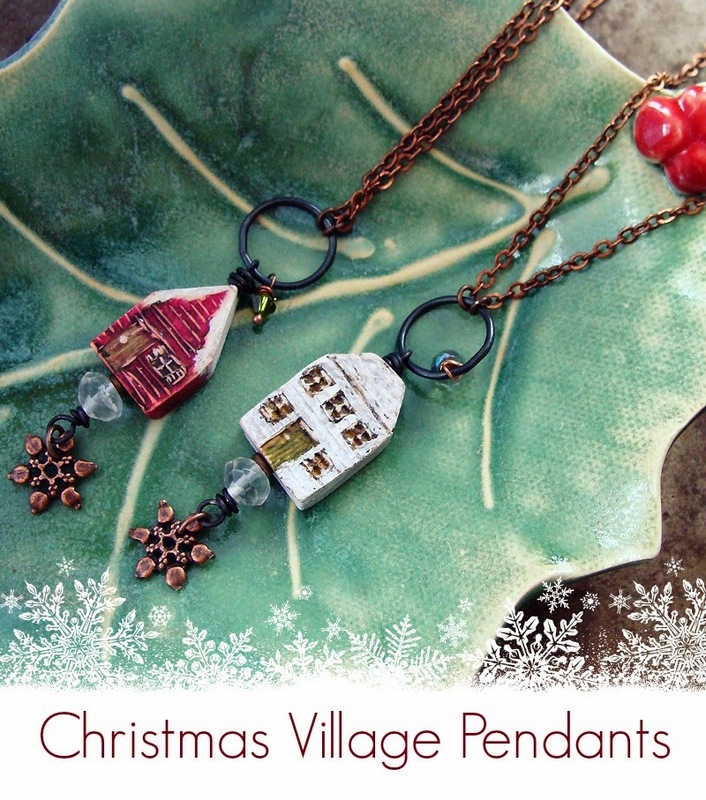 I absolutely love your Christmas Village Pendants. What a festive idea. I have used large flat filigree disks and reshaped them into 'taco' shapes for a co worker that was going to a Cinco De Mayo party. She wanted earrings and a matching neckace with tacos and chili peppers. I made the tacos with the disks then 'stuffed' the taco with different colors of seed beads to look like all the taco fixings' . They turned out super cute and I kick myself for being so proud of the piece that I took it to her right away and never did get a photo of it. Love this! The most creative I've gotten is to use bead caps upside down - changes things up a bit! Happy Holidays! Actually, I got this idea from you. I take an ornament that I have made with a hole through the center and put a headpin through the bottom to the top and then put a large bead cap on then a smaller bead cap. I make a loop with the head pin and do a wrap so I have a way to attach a hook. I like to take individual links from large sized chain and hammer them flat. If they are large enough I also add texture to them. I use them for links in both necklaces and earrings. Such lovely little winter cabins! Really makes you long for snowy days. Different ways of using findings have included making an "invisible" clasp from a bolo tie finding, bead cap flower charms, bead cap beads, and turning a broken box clasp into a pendant/charm. Once saw a tip about using chain links as jump rings, which I've done a few times when missing suitable jump rings. Aaah you always throw out a good question. I use jump rings for many different things; linking, stacking, chain maille, repairing, etc. I've used bead caps for little bells on the bottom of earrings, with a dangling small metal bead, to make it jingle. I love bead caps as a little nest for bird or egg beads. I love your beads. I've used bead caps as a bail for a pendant. I've used jump rings for charms, links, etc. I've used bead caps as charms or charm holders. I don't know if it counts as a finding, but I recently created a necklace using a lily pendant (I think that's what it's called...they come in brass for sure, and the one I used was antique silver plated) as the focal. I created a whole bunch of little dangles that I attached to a wire loop on the inside of the lily. I like how it turned out very much! I do like the cabins, Heather, so cozy looking and such fun! What wonderful holiday houses! ng - I took a broken hollow hoop earring and 'dremeled' off the ends to a 'C' shape. Beading wire went through the shape and various beads were added to each side till necklace length. Viola, reading glasses holder! I've covered a headpin with polymer clay to turn a bead into a pendant. Hmm, how have I been clever with a finding. I think I once used a toggle ring as a "charm" holder for a chain necklace. Not super creative. Very Beautiful & Thanks for sharing. Keep posting like this.